New research reveals the most stressful London borough to work in. Work-related stress, depression, and anxiety has been a hotly debated topic across the UK in recent years, and with good reason too. According to the government’s Health and Safety Executive (HSE) website, 526,000 workers across the UK suffered from some form of work-related stress, depression, or anxiety in 2016/2017, which has led to an enormous 12.5 million business working days lost. According to a survey published by The Telegraph, 59% of workers in London specifically said they suffer with workplace stress/anxiety making it a serious issue regarding working in the capital. But if we were to look into this further, breaking this down by borough – which area within our capital has the highest rates? We at SpaSeekers.com analysed social media to track which areas of the capital are suffering the most when it comes to mental health. 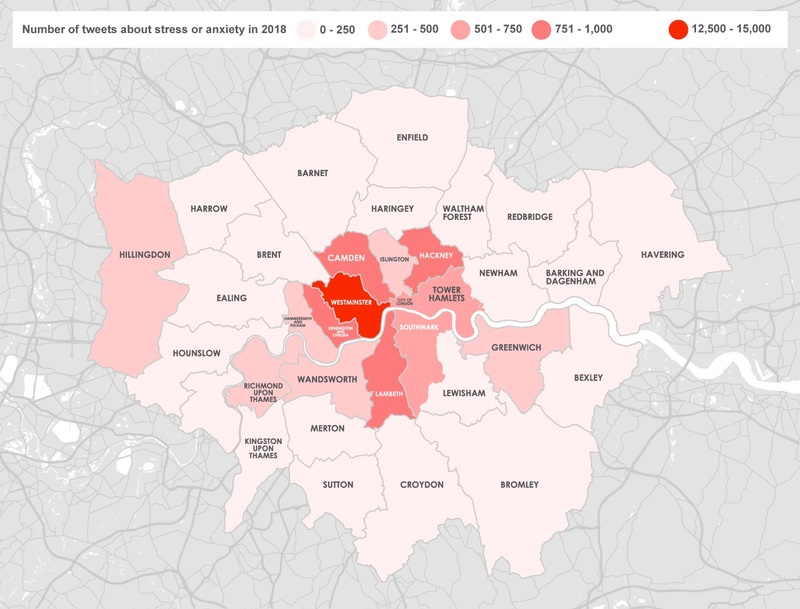 We tracked a total of 24,000 mentions of the words stress and anxiety across London between January and September 2018*. Westminster topped the list as the most stressed-out London borough, with 12,808 mentions of stress and anxiety across social media channels. 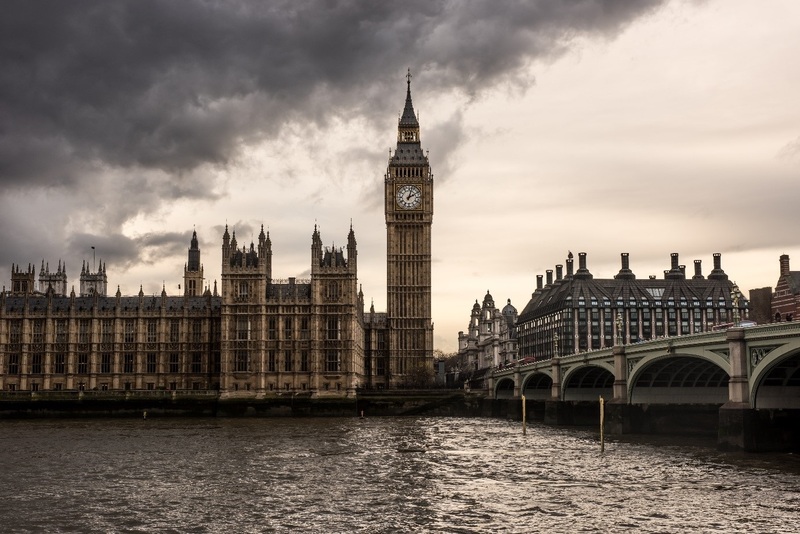 Home to the Palace of Westminster, the central borough is the workplace for many government workers, which may have been a prime contributor to the higher levels of stress recorded in the area. Despite being known for cutting-edge eateries and artsy shops, the trendy neighbourhoods of Hackney and Camden appear to be full of angst. Data in Hackney shows 874 mentions of stress and anxiety since the new year began, while Camden was close behind with 868. Hipster-friendly Lambeth came in fourth, with 804 mentions. The heatmap above demonstrates that the most central areas of London are the ones that tend to have higher levels of stress, except for Hillingdon further out in West London, which lands at ninth on the list with 462 stress-related social media mentions. At the other end of the scale, Barking and Dagenham came out as the least stressed borough – a mere 34 mentions of our tracked hashtags put it in 33rd place. According to HSE, those working in public administration and defence had higher than average levels of stress within the workplace, with over 2,000 reported cases per 100,000 employees. The report by The Telegraph also highlighted the most common cause of work-related stress was working long hours, with office politics and customer/client satisfaction also key contributors. Workers earning more than £40k per annum were also more likely to suffer from mental health issues as a result of their jobs. Today, employers are under more pressure than ever before to provide their staff with a comfortable and supportive environment that remains as stress-free as possible. There is even a nationwide campaign underway to force all employers to have a mental health first aider in the workplace, led by Leeds-based solicitor and Managing Director of Thrive Law, Jodie Hill. “We have physical first aiders in the workplace, and yet mental health issues occur more often and cost more to businesses,” said Hill in an interview with the Yorkshire Post. “The law is outdated in this area and needs reform. As much as the onus is on employers to create the right working environment for its employees, there are also several ways we can all help ourselves to minimise stress in the workplace. Here are four tips to help you achieve a more productive, stress-free day. A badly planned, chaotic morning is only going to pave the way for more chaos throughout the day. Preparing for your working day the night before and getting a good night’s sleep can all help reduce early stress, as can proper nutrition and a morning workout (schedule permitting, of course). Once at work, make sure you have a clear understanding of the tasks you need to complete for the day. Do you have everything you need to carry out the job to the best of your ability? Clarify the requirements expected of you and plan your day ahead, and you will be able to focus on the end result more clearly. It goes without saying that a disruptive, uncomfortable working environment is not ideal for doing brilliant work. If you are having difficulty concentrating due to excess noise, try find a quieter, more isolated space to work in, even just for a few hours. If your employer has a flexible working policy, then why not take advantage? You’d be surprised at how much extra work you can get done in the comfort of your own home, even for just half a day each week. Being cooped up in an office all day can send anyone stir-crazy, so why not take yourself out for a walk at lunchtime for a bit of fresh air or even a spot of exercise? Just 30 minutes away from the office environment can leave you feeling revitalised, and ready to blitz rest of the day. Stress, anxiety, and depression in the workplace have received a lot of publicity in the last few years, and yet there is still so much both employers and employees can do to achieve a more positive state of mind. For example, look at how a digital detox can help you reduce stress over the weekend for a more productive week ahead.